Alexander Cowan was the founder of the firm of Alex Cowan & Sons, papermakers, which flourished in Penicuik, Midlothian, from the 1830s to the 1960s. Their mill at Valleyfield in Penicuik was the first papermill on the River Esk (Penicuik eventually had six). Valleyfield was founded in 1709 by Sir John Clerk of Penicuik, passing into government hands during the Napoleonic wars. Alexander Cowan bought it in 1830. The firm prospered, producing, among other things, high quality paper for banknotes. It went on to own several other mills in the vicinity. Alexander’s son Charles invented a number of technical improvements. The Valleyfield site was extended several times. The last representative of the Cowan family left the Board in 1965, and the Reed Paper Group bought the company the following year. Alexander Cowan was a great philanthropist, said to have given away more than half his income to charity. It was reported that, when walking down the Canongate, he was so struck by the poverty and cold of the houses with their cracked, broken and rag-stuffed windows that he gave his glazier instructions to repair every window from the Castle Hill to Holyrood at his own expense. When he died on 13 February 1859, he left money for the common good of Penicuik people, from which the Cowan Institute (Town Hall) was later built and endowed with 5,000 books. Alexander Cowan was born in Edinburgh on 17 June 1775. He married twice. His first wife, Elizabeth Hall, bore him 11 children, before dying in 1829 at the age of 38. By his second wife, Helen Brodie, he had nine children. 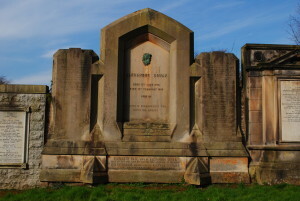 Alexander’s monument in the Grange Cemetery commemorates both his wives, and several of his children and grandchildren. Elizabeth Hall (1781-1829) married Alexander on 31 May 1800 in Cargilfield, near Edinburgh, and was buried in Valleyfield. He married Helen Brodie (1796-1863) on 14 August 1830. Two of his children by Elizabeth are remembered on the monument. Daughter Elizabeth (1810-1887) married Alexander Philip Thompson (1805-1836), an ex Cavalry officer who became a curate and died of consumption in Torquay. Son James Cowan (1816-1895) was Lord Provost of Edinburgh, and a Liberal MP. He married his cousin Charlotte Cowan (1822-1882). Five of Helen Brodie’s children are mentioned on the monument. Three did not marry: Isabella Cowan (1833-1908), Josephine Catherine Cowan (1839-1905) and Charlotte Jemima Cowan (1842-1872). Susannah Hathaway Cowan (1840-1925) married a doctor, William Scobie Mackenzie. Alexander Oswald Cowan (1834-1882), also a doctor, married Rachel Marion Scott (1850-1938). Alexander Oswald and Rachel’s five children are also commemorated: Alexander Cowan (1873-1955), an accountant; Oswald Brodie Cowan (1876-1939) and Kenneth Cowan (1880-1974), farmers in Rossshire; James Scott Cowan (1875-1942); and Geoffrey Cowan (1878-1957), doctor, and his wife Caroline Dorothea Edgell (1882-1972).